The advanced connection management, wide main input range, coupled with the dual SIM failover and firewall / VPN support makes the M3GIR one of the most reliable and secure wireless methods to communicate. The Maestro 3G Industrial Router is designed to allow fast connectivity to the Internet, to back-end applications, or to other devices. Maestro 3G Industrial Router is a GPRS/EDGE/UMTS/HSPA+ wireless single port router for fast wireless IP connectivity. 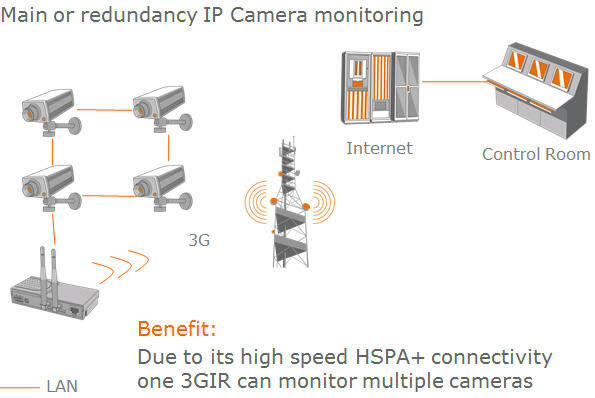 By using the 3GIR, it is possible to connect from remote sites to a central site by using the built-in IP-IP tunneling feature. Devices can communicate across firewalls and handle bidirectional communications across a NAT barrier. The Ultimate Industrial Router Designed for critical industrial applications the Maestro 3GIR features two cellular SIM slots for automatic network fail over should the primary connection be lost. An additional power input is also available to plug a battery back-up.